Pianist Magazine is the international piano magazine for people who love to play the piano. Published every other month, it’s brimming with piano tips, advice, lessons, interviews, a plethora of complete piano scores (a forty page pull-out), accompanying CD, online tuition, and everything piano lovers want and need to know. I am thrilled to now be a member of the writing team; my first article has been published in issue number 78, the June/July publication which is available today. 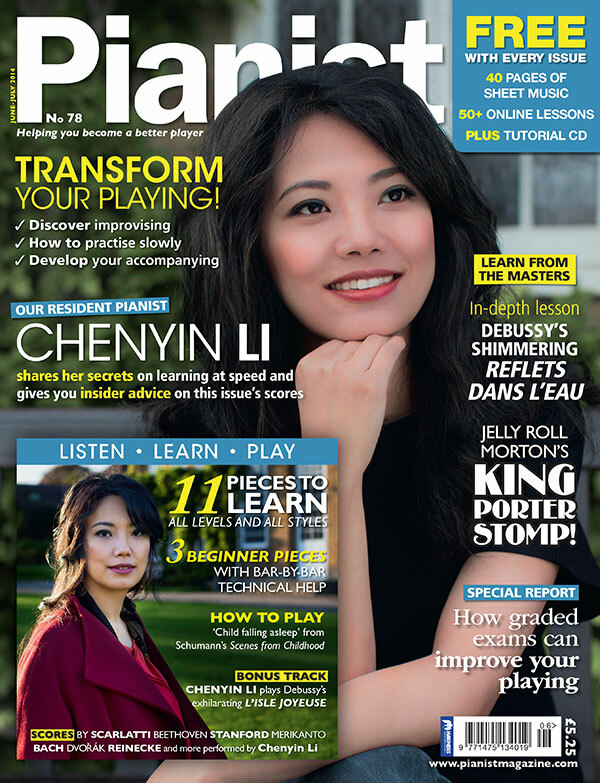 In this month’s Pianist Magazine house pianist, the Chinese concert pianist Chenyin Li, is the cover star. Chenyin performs recitals and concertos all over the world but she still has time to record all the pieces on Pianist’s covermount CD to perfection. She talks to Jessica Duchen about this all-important work that she does for Pianist. There are some real delights inside the Scores pages this issue. There’s the ‘Child Falling Asleep’ from Schumann’s popular Kinderszenen (perfect for the intermediate pianist) with a ‘How to Play’ on it too from Janet Newman. Lucy Parham gives her Advanced Lesson on Debussy’s Reflets dans l’eau. It’s such a monumental work – no doubt a lot of Pianist’s more advanced pianists will be keen to learn it. Other pieces include a Bach Bourrée, a waltz by the unknown Oskar Merikanto, a little gem by Dvorák, a Scarlatti minuet and much more. Not forgetting Jelly Roll Morton’s fabulous King Porter Stomp (with an article about the composer alongside it). Plus, all beginner pieces have notation written within the music, giving bar-by-bar technical advice. My own instructional column is entitled ‘How to Play’ for Beginners! 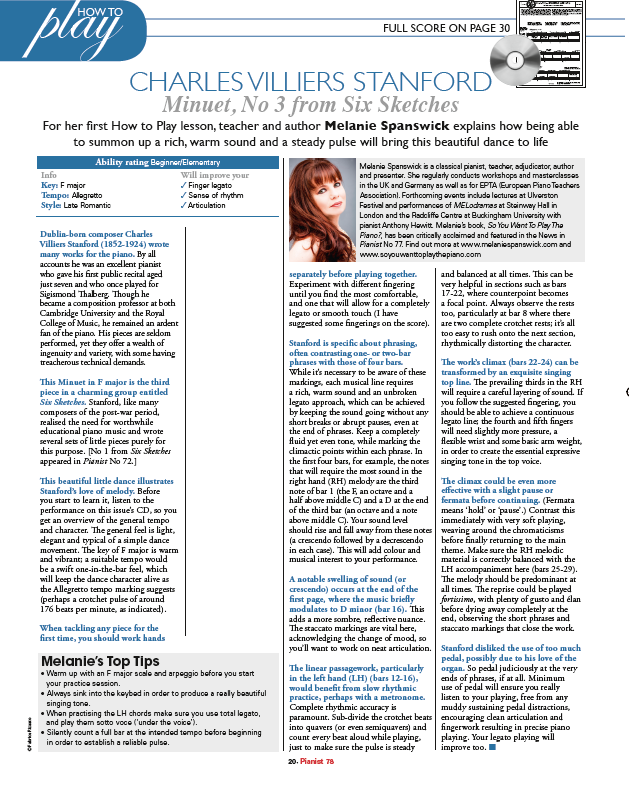 and this month I write about a lovely minuet by British composer Charles Villiers Stanford, taking you step by step through the learning process. This is the perfect first recital piece and a great introduction to English music. I will be writing about many more piano gems inside every issue of Pianist. Other How to Play articles include Graham Fitch on Practising at Different Tempos (you can watch Graham give video lessons too, on the Pianist website) and Mark Tanner on Improvising. Piano Exams: Should we or shouldn’t we, that might be the question? But the benefits are numerous. Read what shadow chancellor Ed Balls has to say about his past exam experience! Then there’s an article on How to keep your piano in tip-top condition (whether it’s an upright, grand or acoustic). ‘Week in the Life Of…’ features Sunday Times Music Critic Hugh Canning. Erica Worth flies to Istanbul to discover a very exotic orchestra about to appear at this year’s Proms. Plus, you can also watch Pianist’s house pianist Chenyin Li perform some of the pieces featured inside the Scores. There’s nothing like watching the experts. Enjoy! That’s awesome!! Congrats!! I’ll be looking for this issue!!! Exciting for you. It’s a great mag and played through the rather delightful Stanford last night.